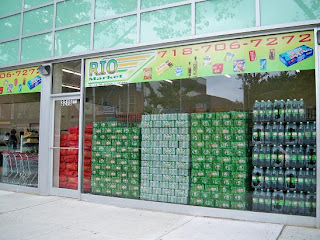 I was both surprised and delighted when I saw that a new Brazilian specialty supermarket opened up on 36th Avenue and 32nd street. A bit confused at first, I couldn't figure out what it was, as the space also houses a Brazilian travel agency and a small eatery, offering various grilled meats and even desserts. Exploring the supermarket portion, which is located in the middle of the two aforementioned businesses, I saw that that they carry a lot of interesting national foods such as breads (both sweet and savory), meat, sweets and inventive frozen foods such as croquettes. They offered a generous tasting of the latter and they were delicious--I really liked the chicken breast and cheese croquette the best and might have to buy it the next time I host a cocktail party. Prices are inexpensive and judging by Saturday's traffic, it doesn't get crowded. I'd suggest checking it out and stopping at Arepas Cafe for an afternoon snack. Yum! Very cool - I will have to check this out! Definitely try the cone pizza. Ohhh, interesting suggestion, thank you! Me too - so cute and so inexpensive. I saw them on Ch. 5's morning show on Friday (8/28) and stopped by that afternoon. I picked up a cup of coffee and a pastry (faboo) and trolled the aisles, bought about $20 worth of coffee and food. The prepared food at the counter did look fantastic. The food counter staff was offhand and non-welcoming, the floor staff and cashier distracted. You're right about low traffic; they may be having problems. It'll get worse if they don't learn to share some of that legendary Brazilian warmth and hospitality -- real quick. I know what you mean Anon - when I was there, no one really said "hi, may I help you with anything? Do you have any questions?" I felt like an outsider but oh well, it's worth it for good and interesting food.